Corta-Vet HA Regular Strength Powder for Horses is a complementary feed supplement to support and maintain healthy joint tissue in horses, as part of a balanced diet. 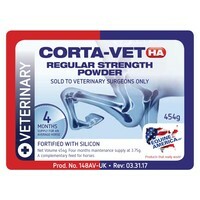 Containing a formulation of the essential isolates of Chondroitin and Glucosamine to provide the body with building blocks of healthy joints, Corta-Vet also contains high levels of Hyaluronic Acid (HA); a key ingredient in joint lubrication fluid. For a 500kg horses, per day: For Hard Work: 7.5g. For Maintenance: 3.75g (half measure). Maximum per day: 7.5g (7.5g measure enclosed). Feed others according to body weight: Less for smaller horses and ponies, and more for larger breeds, or as directed by a Veterinary Surgeon. Have an old horse with joints, who need this product. Looking foreward to a good result.